full disclosure: my aforementioned jaunt to the office the day after christmas was all about posting this picture. i didn't actually bring the camera to the office, so that was a bit of a bust, and i ran out of charge when i was uploading images yesterday - the universe doesn't want me to photoblog, apparently - but here it is, damn it: my favorite yuletide image of '06. 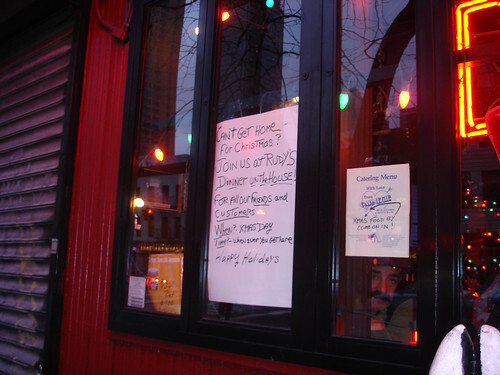 this sums up what i love about my neighborhood (and dive bars) quite nicely: if you're having an orphan holiday, hey, come on down and have a sandwich (from carnegie deli, no less - those are meat snowballs, really, not sandwiches). i was tempted to join them, even though joe and i were having our time-honored christmas fondue and he lacks my fondness for rudy's. consider palo alto, by contrast, where a local once posted for students in the stanford daily classifieds (STRANDED FOR THE HOLIDAYS?) in order to find cheap servers for their thanksgiving dinner. this sign killed my customary misanthropy for a few hours. yay neighbors!